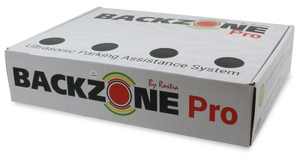 Compared to Rostra’s standard BackZone Plus and FrontZone parking assistance systems, the BackZone Pro includes a dashboard/visor mount display with a smaller overall footprint designed to more seamlessly blend into a vehicle’s interior. 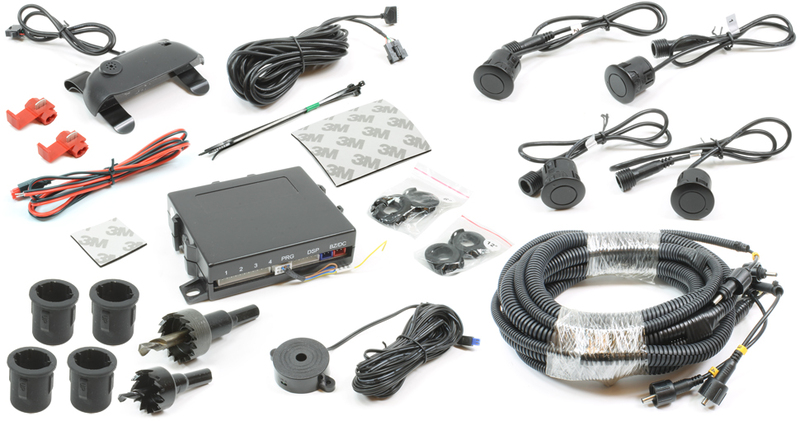 17.5” leads on each ultrasonic sensor means it is easier to connect the weather-proof ends of the sensors to the extension harness on any vehicle. Stylish, low-profile, paintable ultrasonic sensors allow you to keep the factory fit and finish of your vehicle while adding an extra dimension of driving safety. Every BackZone Pro system ships with full-color retail packaging. This box design acts as a “silent salesman” in your showroom detailing the myriad features of the BackZone Pro system. Likewise, the box was redesigned with warehouse distributors in mind providing ample blank panel space for multiple UPC label sizes allowing easy storage and quick retrieval from a warehouse. Make safer parking decisions by using a BackZone Pro automotive parking assist to alert you to obstacles closing in on your vehicle while parking. BackZone Pro' advanced ultrasonic-based technology means the system offers consistency on targets of all densities with fewer false alarms. The flat black sensors included with each 250-1903-BZP BackZone Pro kit can be painted to match the factory fit and finish of your car! The audible alarm included in each BackZone Pro automotive parking assist kit provides a unique way of alerting drivers to nearby unseen obstacles. Safety Zone: 45" - 98"
When your vehicle is within the BackZone Pro's "Safety Zone", an object has been detected but is between 45" and 98" away. When an object is detected within this zone, a slow beeping will begin emanating from the digital display and green indicator lights will illuminate to let you know whether the object is more to the left or right-hand side of your vehicle. As you approach the detected object, the beeping will increase in rapidity. Caution Zone: 21" - 44"
The "Caution Zone" of the BackZone Pro is meant to increase your awareness to the fact that an object that has been detected between 21" and 44" from your vehicle. Once inside this zone, the beeping emanating from the digital display will increase in speed and yellow indicator lights will illuminate to let you know whether the object is more to the left or right-hand side of your vehicle. As you approach the detected object, the beeping will continue to increase in rapidity. Danger Zone: 0" - 20"
Once within the BackZone Pro's "Danger Zone", your vehicle is dangerously close to making contact with an object that has been detected. The audible beeping alert from the digital display will increase in speed from a staggered beeping to a solid tone. All indicator lights on the display's face will be illuminated at this point letting you know whether the object is more to the left or right-hand side of your vehicle. Hover your mouse over each detection zone for a description of how the system reacts. Full-color retail packaging with space of barcode labels. Drilling template for accurately aligning sensors to bumper. Four flush-mount ultrasonic sensors with paintable bezel *. Four rubber insulator sensor sleeves for use on steel bumpers. 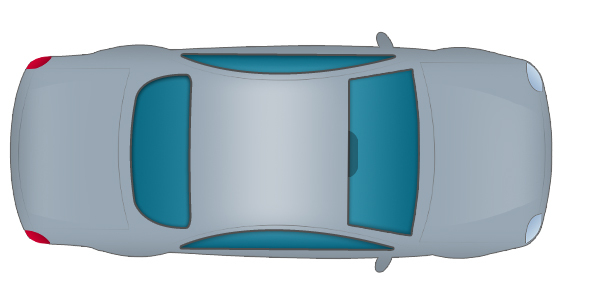 Four under-bumper mounts for mounting beneath bumpers. Stainless steel under-bumper mounting hardware. 8-foot sensor to control module extension harness. BackZone Pro control module with advanced firmware. Standalone buzzer with 19’ extension harness ***. 21.5 mm hole saw for use with sensor-only installation. 24.5 mm hole saw for use with rubber insulator installation. Two-wire harness for making power and ground connections. Two quick splice connectors for use on power and ground wires. Cable ties for securing extension harness to vehicle body. Four 6-degree angled sensor bezels for angled bumper covers. Four 12-degree angled sensor bezels for angled bumper covers. 3M VHB mounting tape to secure control module in place. 3M VHB mounting tape for securing dashboard display in place. * Sensors include 17.5” wire leads. ** Options for Off, Visual Display Only, or Visual Display and Audio Output (90 dB). *** Options for High Audio Output (105 dB) and Low Audio Output (90 dB). Download a copy of the BackZone Pro owner's manual by clicking here. The cost of a parking aid is often less than the insurance deductible incurred in an accident. Protect your investment with Rostra's economical BackZone Pro!